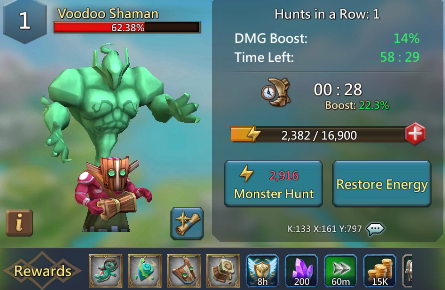 As we all know, the monster hunt is one of the most important features in Lords Mobile. You must join in a Guild to hunt monsters. After you defeating monsters successfully, each guildmate(include you) will get loot. You will stand a chance to get rare items and precious resources from them. Hunting monsters require energy to be spent. The energy costs of monsters are 3,000 units for level 1, 5,000 units for level 2, 8,000 units for level 3 and 14,000 units for level 4. It is possible to increase your damage by using the DMG Boost x(X) function. Here the (X) stands for the number your damage is multiplied by. BlackWing is weak to physical damage and has high Magic damage defense, using heroes that do physical damage is the best route. Saber Fang: Powerful and unpredictable, the Saberfang will wreak havoc among your ranks. Use magic to bring it down before it decimates your troops! The Noceros is a tough creature! Its thick hide can withstand Physical Damage and its Crystal Horns have the ability to lower your Heroes' Healing Focus. Use skills that deal Magic DMG to defeat it! The Grim Reaper will harvest the soul of the Hero with the highest Max HP. Use your skills to deal Physical DMG to it before it can claim more victims! The ruthless Hell Drider will attack the Hero with the highest max HP, dealing damage to other Heroes near its target as well. It is also protected by an energy shield, so send your strongest Heroes to destroy it! Use Magical Heroes to defeat it! The Mega Maggot's mighty tail packs a massive sting! Its venom deals continuous damage, so remember to heal your heroes. Gargantua's skill can deal massive damage to its target and the Heroes nearby. You may need more Heroes that can recover HP to survive. It also has very high PDEF, so bring your Heroes with skills that deal Magic DMG to tackle this one! Terrorthorn lashes its vine whips at Heroes, rendering them immobilized. It also blasts nearby Heroes with seeds, knocking them back. Survive its onslaught to kill this fearsome monster! Use All Physical Damage Heroes to Defeat this Horror! The Snow Beast always targets the Hero furthest from itself. It charges at the target with its enormous body and also causes all Heroes hit take damage over time. Use Heroes that can deal high damage against this fearsome beast! Use all Physical Damage Heroes to defeat this monster! The Voodoo Shaman is full of tricks! This rogue exudes a debilitating aura, and has the ability to petrify foes with its strange magic. Take it down with Physical attacks before your heroes succumb to its sinister spells! This guide suited for the F2P player, these heroes can be instead of other heroes. If you have better advice, please comment below.